The Riley company motto, “As old as the industry – as modern as the hour” summed up the product range very nicely, their cars following the latest fashion for low slung, elegant coachwork. Sharing virtually the same chassis as the MPH but now even stiffer thanks to boxed-in side members, the Sprite also benefited from improved Girling rod-actuated brakes in place of the cable brakes on the Imp and the MPH. Luggage space was slightly increased by lengthening the tail and the cabin was made marginally roomier by moving the dashboard forward, but it was still very restricted by any standards. Both manual and pre-selector gearboxes were offered but, as usual, the latter was a far more popular option. Rear end styling was almost identical to the MPH with a fully enclosed spare wheel on top of the 15-gallon fuel tank, but the front end was much more modern with a ‘bird cage’ type grille which so appalled some traditionalists that a more conventional slatted type was offered as an option! Priced at £425 it was, like the MPH, very expensive compared to its obvious UK rivals and sales were never going to be brisk, even given proper marketing support. It is not known exactly how many Sprites were made before production petered out in 1938, but best estimates suggest that it was between 50 and 55. EMB 136 was purchased new through Blake and Co. of Chester in 1938 by Lady Mary Grosvenor. The youngest daughter of the 2nd Duke of Westminster (one of the richest families in the world), she was a keen racing and rally driver. Before the outbreak of war, she is known to have competed in several Riley Sprites, migrating to a Type 35 Bugatti in 1947 and subsequently an Alta and a Le Mans Rep Frazer-Nash. She finally retired from racing in 1953 to concentrate on running her large estates both in the UK and abroad. By 1952, Lady Mary had sold the Sprite back to Blake & Co Garage of Chester, the accompanying buff log books listing a string of six further owners before it was bought by Jack McEwen in 1965. By this time, the car was in a rather neglected state and he set about a thorough and comprehensive restoration. Once completed, he used it extensively in VSCC events until the vendor acquired the car from him in 1986. A large box of accumulated silverware dating from the period of Jack McEwen’s ownership accompanies the car, with well over 25 trophies and tankards. Since then it has led a more relaxed life, competing in various local sprints and events. Maintained regardless of expense, it has been rewired and re-upholstered in red leather. The wheels have been rebuilt and fitted with new tyres. It has been kept ‘on the button’ and given regular exercise and is MOTd until July 2015. There are some bills on file for recent work and 24 old MOTs show that it has covered just 7,600 miles since 1986. The vendor is also including a number of useful spares in the sale, including a spare centrifugal clutch, new head gasket, a rebuilt Scintilla magneto and a crownwheel and pinion. 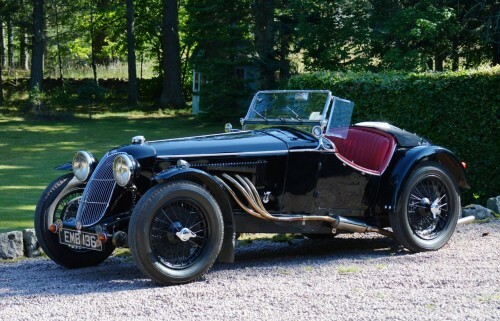 This well known, continuous history car comes with an excellent pre-war competition history having been owned and driven by one of the period’s high profile lady competitors. Its subsequent successes in the hands of Jack McEwen in the 1970s add significantly to its history, its current owner having maintained it in lovely useable condition since he acquired it 28 years ago. This is indeed a rare opportunity to buy the very best. Prospective bidders are advised that this car completed the Mille Miglia event in 1972 in the hands of Jack McEwen.